In this passage we see Jesus speaking about two judgments in one sentence. First, there is the judgment of death that man has brought upon Him. The chief priests and the whole council tried to find two or more witnesses that could agree on a testimony that would put Jesus to death. Try as hard as they may, they couldn't come up with any evidence strong enough to convict Him. People lied about Jesus, but their stories did not match up. The high priest wanted Jesus to respond to these witnesses, but the Lord remained silent. Finally, probably out of frustration, he took a shot in the dark and asked Jesus, "Are you the Christ, the Son of the Blessed?" Now any innocent person would have said "no" at this point, or at least he would have kept his mouth shut like before. But this innocent person truly is the Son of God. He is God incarnate, and He chose this moment to open His mouth and speak the truth, thus having condemned Himself to death. Jesus answered, "I am." Not only does Jesus answer yes to the chief priest's condemning question, but He invokes the name of God for Himself while doing so. Double whammy! There is nothing left to hear. Jesus had plead guilty. Human testimony was not strong enough to convict Him. Jesus controlled His own fate. Even so, He chose the cross. 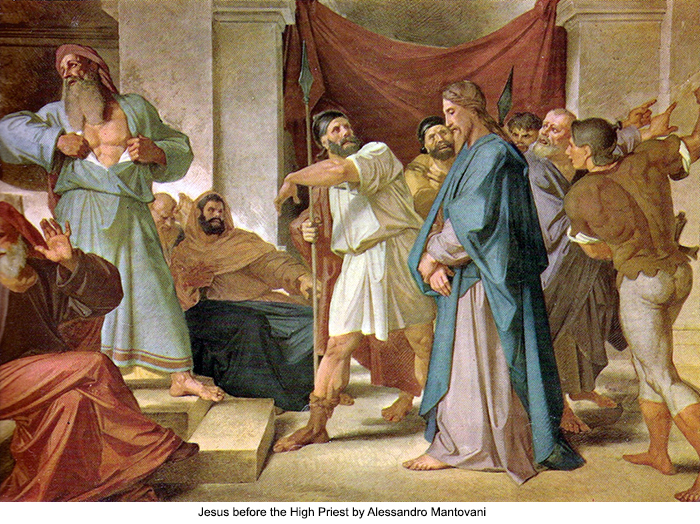 The high priest tore his clothes and said, "What further witnesses do we need? You have heard his blasphemy. What is your decision?" And they condemned him as deserving death. Yet, in Jesus' words, there is a second judgment. Jesus also said, "and you will see the Son of Man seated at the right hand of Power, and coming with the clouds of heaven." He is now speaking not only to the high priest, but to all those around him, as the the verb tense for "you will see" (ὄψεσθε) is plural. These chief priests and that Jewish council will see Jesus in His glory, sitting at the right hand of the Father. He will come with the clouds of heaven. This phrase "coming with the clouds of heaven" is descriptive, apocalyptic language that is often used to describe God's judgment. We see it a number of times in the Old Testament, especially when a prophet had declared destructive judgment on a nation. (Here are a few examples.) So Jesus is telling those that condemned Him that they will one day see judgment return upon their heads. On this day of reckoning, Christ will be the One to declare who is guilty and who is innocent. These religious leaders were blind to who Jesus really is. Though they were witnesses to His miracles and authoritative teaching, they did not believe that He was the Christ, the Son of God. Instead, they found Him to be a blasphemer and sentenced Him to death. They will be judged for their unbelief. You too are guilty of unbelief. Each time you break one of God's commandments, you declare yourself to be wiser than God. You make yourself out to be the judge of what is right and wrong, not considering your Creator. Jesus will come again in power and with the clouds of heaven. He will be the judge over all that you have done. Yet there is still hope. You see, in this dual judgment, Jesus made a way for your salvation. The religious leaders found Jesus guilty. You and I declare that same judgment whenever we sin. Jesus does not argue with the conviction and pays the penalty of death on the cross. God's wrath, which we deserve, was poured out on Him. We can now receive forgiveness for all of our sins if we repent and believe in Jesus. Turn away from your sins and unbelief and trust in the One who can free you from the coming judgment. Jesus has the power to convict you of all of your crimes. But He has the power to set you free as well. Do not wait another second. Put your faith in Jesus!